Hand selected and individually graded, our Red Box Diamonds® bring benefits that are unique to your purchase. Every Red Box Diamonds® comes with a grading report from an independent team of GIA and AGS trained experts that are graded to GIA standards. Each Red Box Diamonds® come with proof positive identification because each diamond is laser-inscribed with the unique number on its grading report. 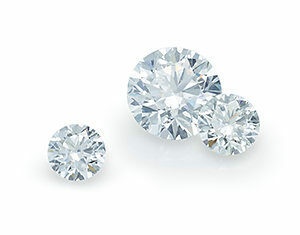 Exported and imported with a government validated Kimberley Process certificate stating the diamonds are conflict-free. Transported between signatory countries in a sealed and tamper-proof container. Purchased with a statement with a guarantee that your diamonds being are conflict-free. You receive a full credit for her Red Box Diamonds® when she trades it up for a higher priced Red Box Diamond® in our active inventory. You can have confidence that the diamond you are purchasing will hold its value over time. Should you wish to upgrade to a larger or better quality Red Box Diamond®, you will be given you full credit of the amount paid towards a new diamond. This is for the diamond only and does not include the amount paid for the mounting. Red Box Diamonds® comes with 1-year complimentary insurance through GemShield®. The coverage offers immediate protection against loss, theft, or damage. Once GemShield receives notification of your purchase, coverage is immediate. If a loss occurs within the free year, you return to Howard Studios for replacement. Our diamond suppliers replace the diamond through us at no cost to you. When the free year is up, GemShield will contact you and offers you a continual personal jewellery insurance policy.